I thought C Roland Christensen’s response in The Harvard Guide to Influential Books: 113 Distinguished Harvard Professors Discuss the Books That Have Helped to Shape Their Thinking was one of the more interesting. 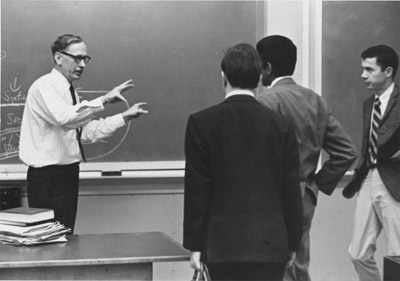 Christensen was a pioneer in the field of business strategy. We can also thank him for reviving the case method from the ancient Greeks. Here are the books—all old, dog-eared, reread and reread, little (no big fat volumes), most committed to memory—of my five-inch bookshelf. But they miss the greatest influence on this educator—Miss Adams, a seventh-grade teacher in Iowa City, Iowa. She introduced me to poetry, where the ultimate wisdom —the philosophy of life—is found. The first step in the development of an anthology was our study of “Miniver Cheevey” by Edwin Arlington Robinson. It is still exciting fifty-four years after that original encounter. understanding the past so as to predict the future. Rostand, a biologist, views man in a very human way, examines how science is impacting that basic humanness and then teases us with what he/she will be in future centuries. Spade tickles the mind; with tongue in cheek, he describes business so that one laughs—even roars—at his chosen vocation. Fabre looks at the smallest and lowest—insects—and shows us their great abilities—even wisdom. A constant reminder to look at the ordinary to see the extraordinary. For the investigator, this little book is a gold mine of reflection and practical suggestion. He brings the power of scientific discipline to bear on everyday life. Power Without Property by Adolph A. Berle, Jr. The book raises fundamental questions about modern business organization and ownership. It outlines the quiet revolution which has changed the power bases of our industrial society. Follow your curiosity, for more in this series check out the books that influenced E. O. Wilson, B. F. Skinner, Thomas C. Shelling, Michael J. Sandel, Jerome Kagan, Stephen Jay Gould, and John Kenneth Galbraith.